In JP's original post, he wrote: Does anyone else believe the time has come for this community to come together on a topic that has been treated like REPELLENT on this forum over the years by developing and promoting a riders etiquette so that our on the water actions will treat our co-riders in a positive manner? Here's an example of a framework that could be use. Does anyone have any input? Anyone?!? Thank you to all that have contributed. Here's our work in progress. 3) Up wind rider keep kite high so that they do not interfere with riders down wind of them. 5) if that doesn’t work - see **Kitesurfing Right of Way** list below. 10) Don't throw unhooked moves near the beach and crash your kite at GG on a northerly like I did - that was bad edicate on my part and there were people around. vance. You can re-write this baby. Note: Always use proper judgement and give up your right-of-way by yielding to anyone, or anything, that may appear to create a situation with your position, or upcoming position. Right hand forward while riding is Starboard Tack (and generally has right-of-way). Left hand forward is Port Tack. 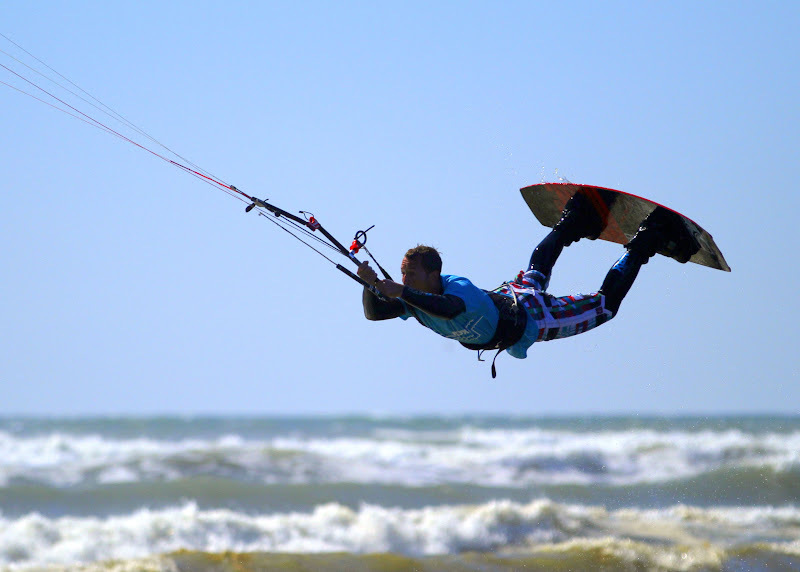 When two kiteboarders converge in a way that may lead to a collision, the kiteboarder on port tack must give way to the kiteboarder on starboard tack. Starboard tack has right of way in this situation. Always give right of way to anyone who enters the 200' safety zone downwind of you. Last edited by j.p. on Tue Jun 07, 2011 8:44 pm, edited 3 times in total. Some of these might be combined. Get in and out quickly when landing and launching. Do not stand around with your kite in the air. Do not kite in the launch and land area. The kite schools don't take up that much area. Out of courtesy, please give them space so the instructors can focus on the lesson instead of worrying about other kite boarders. 1) if someone is bringing in(saving) a board/person/ or kite into shore, they have the right of way no matter what. so performers get the hell out of the way. This is number 1 by far. If you want to rig your lines before you're ready to ride, then attach them and roll those suckers back up. At a beach like Carkeek there's so little room, that 2 sets of lines literally takes up the whole beach...makes us look bad to all the non-kiter beach users and is also annoying for other kiters. Doing this when visiting somewhere else will earn you respect with the local posse, so get in the habit here at home. The focus of on the beach etiquette should be limiting our group's footprint on the beach. The only thing non-kiters should notice about us is how nifty it looks when we ride, not how much space we take up on the beach, or how close they just got to being beheaded, or how some angry dude in a wetsuit yelled at you for being in the way. Thanks for contribution and I completely agree!!! Daniel, Please make this topic a sticky. Thanks! 1) Up wind rider keep kite high so that they do not interfere with riders down wind of them. 3) if that doesn’t work - see **Kitesurfing Right of Way** list below. 5) Hurry up and get out of the way when launching or landing. Someone else if probably trying to launch or land and is waiting for you to move. Note: Right hand forward while riding is Starboard Tack (and generally has right-of-way). eric wrote: I don't know if this topic has been treated totally like a repellent, but I agree that maybe a thread with general etiquette would be good and we could bring it up each year as a reminder. 1) no doubt. I was trying to change my sentence structure to say that I have only been on the forum for 3 years, but it didn't sound right, so I just omitted that part. I should have said "in my experience"
pump up your kite, THEN lay out your lines. Make the students' experience less stressful, don't get in their Wind Window.